Auras can be photographed without even trying it seems. I am grateful to Rich Labate who has given me permission to publish his photograph. Using a Nikon L1 pocket digital camera on automatic, with no filter, Rich was just taking a picture of the view across a valley in New Mexico. 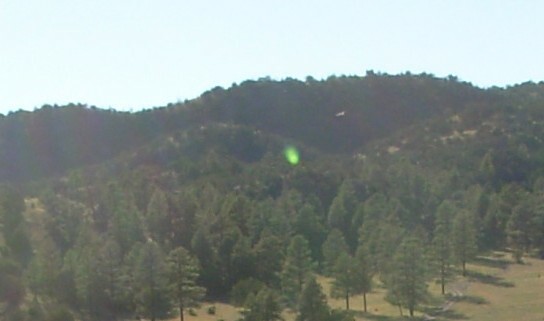 The resulting picture shows a bright green flash on the hillside – local knowledge says that there is a copper mine or copper deposit under the hill. This is not an isolated case of auras accidentally appearing on photographs. I was sent a photo of the site of an Iron Age village in continental Europe, culled from the Internet, which shows what can best be described as a fog patch immediately above the village site. Similarly, my friend Dave was investigating a treasure site and turned up Google Earth aerial and street view photos of the site, which both showed a patch of isolated fog. Unfortunately the site turned out to be a scheduled ancient monument so it cannot be investigated without government permission. The moral of this story is to take a close look at any photographs of possible treasure sites you have, or come across and if you spot anything that looks as if it might be an aura, you could soon be digging up a fortune.